Let’s keep the peat theme… Two new releases this autumn of peaty characters: anCnoc Cutter, a Speyside malt which used to be called Knockdhu, and a new version of Ardbeg Supernova. 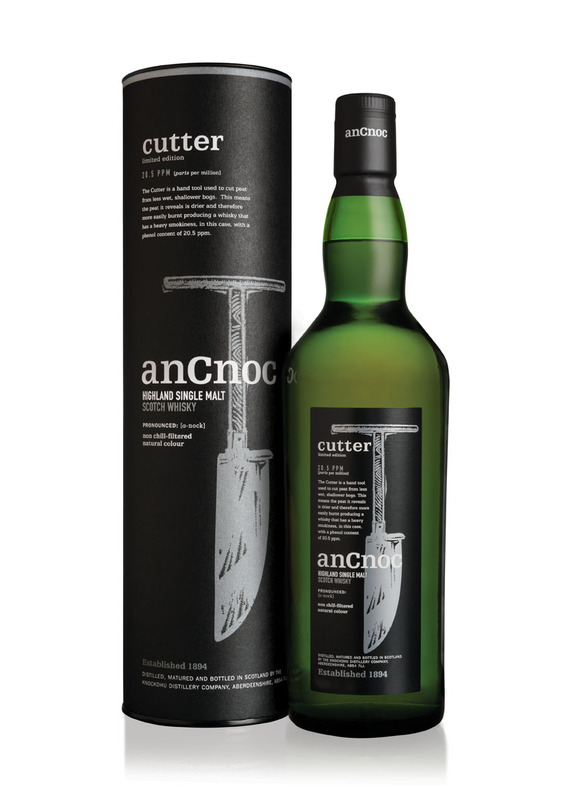 This is the fourth of the new anCnoc Peaty Collection, the names of which feature the tools used for cutting the peat. This cutter illustrates this one. This is the peatiest of the four (20,5 ppm – parts per million – phenol content). 2000 cases have been released. Cutter, a non age statement bourbon cask matured single malt ,retails at £52. Nose: Smooth and sweet with a distinctive smokiness. Lemon grass, fruit. Fresh pineapple, watermelon. Lemon pulp. Palate: Silky, light and refreshing. The smoke lingers gently over citrus notes. Sweet vanilla. Getting creamier. Almond milk. Finish: Crisp, drying on cold smoke. An almondy aftertaste. Grapefuit and lime. Comment: a well balanced refreshing malt. The smoke is in harmony with the fruity character and the creamy vanilla profile. It would be interesting to try it in a cocktail with a citrus liquor such as Grand Marnier. The 2009 and 2010 releases were very popular. 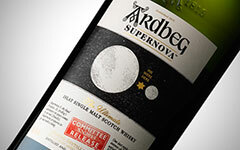 Ardbeg has decided to release a new Supernova. The Space is definitely a new territory for Ardbeg!. This new release is bottled at 55% and it contains a percentage of sherry matured whisky. Retail price £125. Nose: Sweet and phenolic. Wild mint, bogmyrtle, creosote. Hint of eucalyptus. Smoke is present but not overwhelming. Citrus fruit. Grapefruit, kumquat. Palate: Oily. Velvety. Sweet at first then drying on soot. That classic Ardbeg mineral touch (salted pebble). Plenty of sweet licorice root. Poached pears in smoky vanilla. Finish: Spicy, quite warm. Chilli. Quite lingering. Comment: A powerful character wrapped in sweetness and delicate smoke. Not right in your face, but leaving a strong aromatic spicy print on your tongue. In one word, delightful.